Hello Folks----And a Happy Father's day to all the dads out there. As most of you know, I am a bit of a storyteller. So I will blend in some factual story material with this post on CC20 dollar gold. Many out there would tell you to only invest what you can afford to loose. To never think of the coin hobby as an investment arena. Well, in most series, this probably is good advice. But, I doubt it would hold true for the CC20. Back about when silver went out of our coins---1964---I was 18 years old. Had been collecting everything that I could find in change that was 1940 or before. Had been filling up my sets in the blue Whitman folders. I suddenly realized that there was fewer and fewer silver coins out there. I HATED the government for changing our coinage. To this day----I HATE THEM. So, being a smart kid going off to college---but coming home each and every weekend to see my girl---I knew that I needed something that would hold my interest. But, also needed something that I felt was rare---would be exciting to collect----would increase in value----was something that no one else would collect. So, I sat down and thought about it. I came up with either CC20 gold or the 3 dollar gold piece. In the end, I picked the CC because it held more gold content and, because even then, there was a lot of counterfeiting of the 3 dollar gold piece. Coin World came into being in 1960. Bob was soon to get it and I eagerly awaited the Fridays arrival each and every week. My first CC purchase was at my local Baltimore coin shop----an 1875 CC for 95 bucks. Then, I saw an advertisement in Coin World. It said basically---CC20's in XF+ condition----dates of our choice---for 89.50. Since my new purchase was at best a VF coin, I returned it----took a 6 buck hit---and sent my 89.50 to William Youngerman in Florida---and purchased my really first CC20 dollar gold piece. And my fellow board members---it began a love affair that lasted about 12 years. And one, where if I had the money today, I would carefully enter back into with more open eyes. In the end, I managed to buy coins from all over the country. You older collectors might remember some. Some are still in business till this day: Joe Flynn---NERCG---I. Kleinman---Fred Sweeney----Weaver----Youngerman----Ye Old Coin----David Bland---and many more. I managed to get 14 different coins in a period of 10+ years. Thru college and marriage---thru dental school---thru early practice---thru moving. It was Bob's obsession---a dentist with his gold. OTHER than my family---and hunting---it was NUMBER ONE ON MY MIND. I saved every cent that I could---waited patiently---or not so patiently---for each and every coin that I could find or afford. Always in the best condition that was available. Oh, the stories that I could tell you. Of a wonderful adventure in a time of my life that was like it was in olden times. Wonderful memories among the boulders that do come along as well. But, as I look back, mostly great times. Then it hit. I had just gotten a 1871CC in XF condition. This purchase requires its own post. But my dad called. Should he retire?? He was 62. No future if he stayed 3 more years working. I told him to quit and come down to the Eastern Shore with me. Wow--it had only been two years since I had built my house on the property. Only 3 years since I had become a dentist. I had mortgaged myself already to the hilt. There was NO MORE MONEY. But, I owed my dad---big time---as he had allowed me to sell our home and take most of the proceeds with me. What to do?? Remember---there was no Doug Winter book back then. I knew my CC's were valuable---they meant everything to me. Folks---it came down to either the coins---or my dad. Well, thank my God that I picked my dad. I went to New York on the train with my wife---watched my coins---many more than the 14 CC20's---go under the hammer. Dad had 15 real good retirement years. My son, Dave, now lives in the home with his wife and my granddaughter . I do not ever regret my decision to sell. And, it forever has given me a different perspective on collecting. OK----Just like I did with the Walkers. If you should ever have the money, here is the order of difficulty IMHO Naturally the 1870---estimated today to be a total of only 25--35 pieces left around. I could have purchased this coin for between 3,000 and 4,000 back in my day. They were only in Fine--VF condition---so I passed---thinking that a better one would come along. Boy, was I wrong to not buy. The next grouping of 5 coins are the next rarest: 1871---followed by the 72 and the 73 and the 91 and the 79----These are all very tough---especially in XF and above. Not many are left out there. The next grouping are somewhat available--the 77---the 82 being the hardest followed by the 83--84---74--75--76--and the 90. The 74--75--76 grouping is easy in the lower grades but extremely hard in the higher MS grades. I believe to this day that I may have owned the finest known 1876. When it sold, it was sold as an MS65+. In any event, It was one magnificent coin!!! The 90CC is the easiest to obtain. It comes well struck and very nice. A wonderful type coin. Bob, great post. I enjoyed both the coin and non-coin aspects. I do not have the depth or length of experience in CC20's, but when I returned to collecting in 2002 (at age 37), and decide to collect gold, this was my first flirtation. At the time, I knew nothing about coins. I went to a national show in St. Louis, browsed the bourse for an hour or so, and landed at the New World Rarities table. Foolishly, I told Chris (of New World) that I was interested in getting into gold coin collecting but a beginner and "knew nothing about it". At the time, he had a whole case of PCGS CC gold! (I bet he wished he had one of those today.) He talked to me about gold coins and my budget and offered to sell me either an 1882-CC $20 PCGS XF-40 or an 1878-CC $20 PCGS XF-40. I told him that I would take both! The pricing was very fair, it turned out. I then went home and immediately purchased Doug Winter's book on Carson City gold from Amazon, and promptly read it cover to cover. This was the first time a coin book ever captivated me. Soon after, I contacted DW and indicated my interest in collecting CC $20's. I learned that my 1878-CC $20 was a rare die variety; DW later told me that he knew of only two others! While he was supportive of this, and sold me a few coins, I ended up steering myself away from Carson City and away from Liberty $20's. I finally settled on New Orleans and Dahlonega gold, under the mentorship of DW and "Dahlonega" from across the street. From 2002 to about mid-2003, I bought quite a few CC $20's. Most of them were purchased poorly--sight-unseen from Heritage and Scotsman auctions and from other less-than-stellar sources. I learned how not to purchase coins from this expereince. A couple I purchased from DW were terrific: MS-62 1884-CC and 1890-CC's. Over the ensuing years, I sold them all to fund other coin purchases. Unlike some coins, there is great liquidity in CC $20's, and prices have risen in this market. I have also seen the number of pieces on the open market dry up considerably since 2002. My last coin to go was my lovely 1890-CC $20. 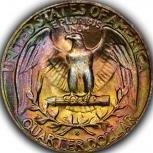 If I ever get back to Carson City gold, it will be for the half eagles, as that has become my denomination of choice. Plus, I already own the best date. I am a novice compared to Bob, but I must disagree with one very minor point. I would put the 1878-CC in the same rarity group as the 1879-CC. Happy Father's Day to all. I'm spending the day with my Dad. I believe to this day that I may have owned the finest known 1876. When it sold, it was sold as an MS65+. Nice reading on the boards today! Thanks for your post, Bob, and for adding your thoughts, Robert. I wonder if the gold bug will bite me someday. You made the right choices, Bob. Excellent story and appropriate today. Family first. We can always aquire 'things' again and I hope you find that same CC20 gold one day. Good stories, supertooth and SageRad. Thanks! Bob and Ryk, wonderful posts, thank you. Bob, now I understand why you're called 'Supertooth'!!! Great post, Bob. One thing that I know is that I have never lost money on decently graded gold coins that I had held for some time. I can't say the same about many other series that I have owned. I just wish that I had saved soe of the gold coins that I purchased in the late sixties. sweet post.. I missed this one.. Thanks for sharing!